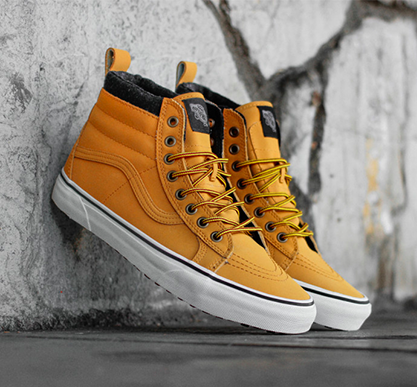 Vans The Sk8-Hi MTE revamps the legendary Vans high top with weatherized additions designed for the elements. Premium Scotchgard®-treated leather uppers, warm linings, and a heat retention layer between sockliner and outsole keep feet warm and dry while the newly-constructed vulcanized lug outsole takes advantage of 20 years of snow boot history for maximum traction. 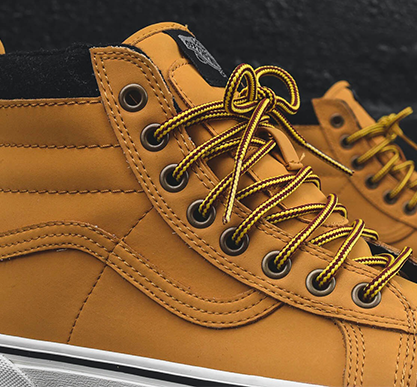 The Sk8-Hi MTE also features re-enforced toecaps to withstand repeated wear, signature waffle rubber outsoles, and padded collar and heel counters for support and flexibility.